I am not, by any stretch of the imagination, an athlete. I have however been active enough to have participated, and continue to participate, in some endurance sports, particularly endurance cycling. I'm not a runner. The thing is, I've participated in and seen enough of these events to see how most people are constantly in search of carbs to keep themselves fueled along the way. Many still argue that "carb loading" before an event can optimize your performance by increasing the amount of glycogen stored in the body that can later be used as energy. See this and this. The number generally referenced for calories burned in a marathon is about 100 calories per mile so you’re going to need around 2,600 calories. If you aren’t adapted to burning fat (which you won’t be if you eat those plates of spaghetti to carb load and down the energy drinks and gels during an event) you are going to have to make up the difference somewhere. So you need to have the gels, drinks, and beans to make up the difference. Unfortunately, if you try to consume those too fast you have a problem with the concentration of sugar (osmolarity) is the stomach. You can only tolerate so much or you are going to get sick. From what I’ve read, you can only absorb about 100 calories every 45 minutes to an hour during a marathon. It doesn't do much good for the calorie deficit I refer to above, to consume carbs at the very end of the marathon, and your ability to digest decreases as the marathon goes on, so with a median marathon time of around 4:45, you are only going to be able to consume about 400 to 500 calories. (If you run faster than that, you're going to need more calories in less time and can absorb even fewer calorie during the event. That means you are only going to have about 2,200 to 2,300 calories at the very most to play with and you are going to need about 2,600. This is when you hit the wall — you simply run out of accessible energy. If you could get to the extreme 3,000 calories available to an elite athlete (with very well-timed carb consumption and training) you should be able to do a marathon without hitting the wall, and not having to cram down fast carbs via gels, energy drinks, etc. But for most of us, that's not going to work. We simply can't get enough fuel. A good article on this subject is here. If you look at endurance cycling, it's even worse. Most typically burn about 800 calories per hour cycling with a 15 MPH average speed. So for a century ride (100 miles) that's about 5,300 calories in about 6 to 7 hours. Hence cyclists tend to load up on bananas, granola, peanut butter and the like at SAG stops. But there is a better (at least different) way. Carbs and fat are the two primary energy sources our bodies can use. Unfortunately, if we regularly consume a high level of carbohydrates (say 150 to 200 gms/day or more) the insulin that must be secreted to process those carbohydrates, also locks up fat stores. For many of us, those fat stores are not easily accessible until our bodies are forced to learn to use fat. This is a process that takes a week or more while minimizing carbohydrate consumption. At most a typical person can store, and access for running, about 1700 calories, as mentioned above. But even a very lean (10% body fat) male at 175 lbs would have over 60,000 calories stored as fat. A more typical, healthy weight individual would have more like 100,000 calories or more of stored fat. 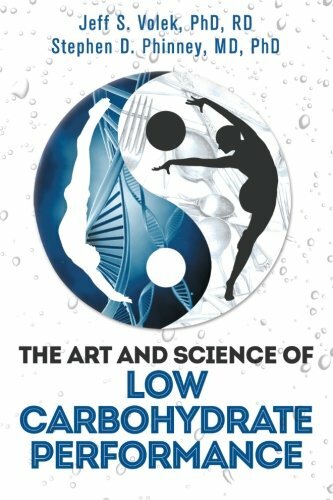 If you consistently consume high levels of carbohydrate and continue to consume those throughout an event, you can't access that energy stored in fat because the insulin in the bloodstream blocks its release. I compare this to a tanker truck hauling gasoline that runs out of fuel (diesel) on the highway. It's loaded with fuel that it can't use. Contrast this to someone who is adapted to burning fat and ketones. (This is what happens if you limit carbohydrate consumption to less than 50 - 75 gms/day for about a month and is called a ketogenic diet.) Even an average, lean individual now has access to nearly 100,000 calories. They should be able to complete a marathon without taking in any additional calories. Think about it, no carefully timed carb loading, no trying to consume enough energy sources during an event without getting sick or hitting the wall. This is true if the exercise remains below the anaerobic threshold since both fat or glycogen/glucose can be burned aerobically. If the exercise is above the anaerobic threshold however, glucose or glycogen are necessary. (This might be the case with a sprinter or weight lifter.) Most endurance sports participants would remain below the anaerobic threshold for most of the time so this wouldn’t be an issue with endurance running, cycling, or triathlons. If you really want to geek out on this, here’s an article about how Dr. Peter Attia experimented on himself with exercise of various levels of exertion both in and out of ketosis. Some other good information on the topic of nutrition and endurance sports performance are in this paper and this video by Dr. Jeff Volek. I've experienced some of these same benefits. For example, I can spontaneously go a day or more without eating and not feeling weakness or lack of energy. In fact, when fasting, I experience a great deal of energy. About a year after I started this approach to nutrition, I decided to start cycling again after a multi-year hiatus and ended up doing a century ride that year. I ate a high fat bacon, eggs, sausage breakfast (no toast) and then did the ride in about 6-1/2 hours, and consumed no real carbs along the way. I only drank sugar free energy drinks to maintain electrolytes and had a couple handfuls of macadamia nuts but never felt that I really needed them, and never felt any lack of energy. Similarly, I did a 1/2 marathon one afternoon (walking at a fairly fast pace -- a 2:41 time) completely fasted. I had no breakfast. I consumed nothing before, during, or after the event. Again, I never felt any lack of energy. I plan to do a century ride in the next year or so completely fasted. I'm not expecting to have any difficulty doing so, and know of others who do this routinely. So while it's possible to get enough energy for endurance sports through carbohydrates and carb loading. I think there's a better option and I for one plan to continue to take advantage of it. I don't suggest that people count calories or even track with great accuracy the macronutrients they eat. I believe if you just focus on avoiding the macronutrients that can be a problem for most of us (carbs) and eating good quality, real foods, then the rest will take care of itself. That has worked pretty well for me in the last several years. I don't count calories, at all. I just watch what I eat in terms of avoiding carbohydrates and focusing on real food. Even with that, when I was learning to eat better three years ago, and when I've talked with others about how they eat and can improve, I see that tracking what you eat with a food journal can be very helpful. That snapshot of where you are at a point in time can give insight as to how you are doing, allows you to focus on the right balance of food, and can help you learn if changes are needed. I thought it would be interesting to take a look at what I typically eat today and compare it to how I used to eat years ago. In other words, my "before" and "after" snapshots, using food journals. I didn't actually capture a food journal for before, but it is pretty easy to think about a typical, representative day, and recreate a food journal that's probably pretty accurate. While I knew this exercise would be pretty educational to demonstrate the use of a food journal for the purpose of this blog post, I was quite surprised by the insight it gave to me about how and why this diet works. Here is my diary from a typical day of food a few years ago was when I was trying (not always successfully) to follow the "conventional wisdom" guidelines for diet. During my typical day years ago I estimate I would consume a total of about 2,900 calories, 43% from carbs, 44% from fat, and 13% from protein. The protein intake would have been around 96 grams. I was also consuming roughly the recommended, or slightly higher, calorie intake for someone my size and activity level. I was consuming around 2,900 calories per day with the recommendation being around 2,700 - 2,900 calories per day. I also remember that I often felt hungry and that I had to eat something every few hours or suffer shakes, headaches, etc, despite my eating on the high side of the recommended range of calories. My diary from a typical day of food today is a bit different, to say the least. During my typical day today I estimate I consume a total of 2,200 calories with a minimum recommendation for someone my size and activity level being around 2,600. Keep in mind that I do not feel like I'm starving and am almost never hungry despite the lower calorie intake, and can go for hours, or even a day, without feeling like I need to eat or risk having the shakes or headaches. My protein consumption works out to be exactly the same at 96 grams! (This was not a setup, it actually came out exactly the same.) If you ever hear of this being a "high protein" diet or the dangers of a "high protein" diet, realize that this is not, and that is not what I recommend. I ate more calories before, and too many for my size and activity level, so I was having issues controlling my weight. I ate a little less fat in terms of total grams before as I do now (141 grams vs. 187 grams) but not nearly as much difference as I would have thought. I ate many more calories before, and most of the additional calories came from carbohydrate. I ate more calories before, BECAUSE I was eating more carbohydrates and had poor control of glucose/insulin swings and the resulting hunger. This also lead to most of the other health issues I was having. I may be eating too few calories today, so it might not hurt to consciously increase consumption a bit, but I'll look to add a little more healthy fat instead of carbohydrate. I'm pretty convinced that these added calories won't lead to increased weight but probably increased energy. When I had done this previously while I was adapting to this way of eating, I observed that when I increased consumption of fat, my weight decreased even faster. Although not obvious from the food diaries, I eat much better quality food, and much less processed food today. I don't believe that anyone should constantly calculate these detailed numbers about their food, or constantly count calories, fat, carbs, or anything else. But occasionally tracking exactly what we're eating can lead to discovery and ensure that we're on the right track. The conventional wisdom, and the mainstream approach to diet and exercise is that you must balance "calories in" with "calories out." What does that really mean? I'm going to attempt to answer that from my perspective, and talk about why I think it is more or less true, yet misguided advice. While calories in may balance calories out, a low carbohydrate approach can take the natural processes that our bodies use and turn them to our advantage. We can make the process of improving our body composition and improving overall health (usually that also means losing weight) relatively easy and automatic, instead of a tremendous feat of willpower. The conventional wisdom on diet and exercise can be summed up in the concept that the calories in the food you eat (calories in) is either burned up, or is converted to fat. When you exercise you burn calories (calories out.) Part of the “calories out” is your “basal metabolic rate” which is simply the energy your body needs to stay alive, even if you are doing nothing else. The idea is that this simple equation governs whether we gain or lose weight. If we eat more and don't exercise more, we gain weight. If we eat less or exercise more, we lose weight. When put this simply, it’s essentially true, but there are more things going on and our bodies aren't that simple, and how easy it is to hold that equation in balance can depend a lot on what kind of calories you consume. If we try to limit our food intake, we are fighting our own body’s chemistry and will have a real struggle. The primary reason this happens, is that when we consume carbohydrates, they quickly turn to glucose in the blood. (See my post on why LCHF diets work.) As glucose goes up after a meal, it must be removed from the bloodstream since too much is toxic so insulin is secreted. Insulin drives blood glucose back down. Assuming someone on the standard American diet high in carbohydrates, the constant insulin surges keep the body form having access to burning fat so when blood glucose drops, this signals more hunger which must be countered with sheer willpower. If we try to hold our “calories in” the same and just try to burn more calories (exercise more) we run into another problem. Our bodies know we’ve burned a lot of calories. If we are consuming a high carbohydrate diet, we can’t access our stored body fat because the constant insulin surges cause fat cells to hold on to their fat stores. This leads to fuel not being available, particularly to the brain which triggers an overwhelming drive to find food. Unless we have tremendous willpower, we’re going to eat more and cancel out all that work we did to burn more calories. The worst case of ramping up exercise and forcing ourselves eat less compounds the problem. And if we're constantly exercising (again, like you see on "The Biggest Loser") you crank up cortisol (the "fight or flight" response) which also triggers the body to hold on stored fat and more hunger. If we eat a low carbohydrate diet, we still have to eat fewer calories than we burn, more or less, if we want to lose weight. The advantage with this approach is that without the constant insulin surges, our fat cells are more than happy to provide the energy the body needs, and we don’t experience the drive the eat. In fact, if we have some fat to lose, our bodies will actually seek ways to burn more of our fat, giving us a tremendous amount of energy. So we’re not violating some natural law that calories in equal calories out. We’re not cheating the system. We’re leveraging the body’s natural systems to our advantage. Turning from the need for a an almost superhuman feat of willpower, to an almost effortless, automatic, and quite natural process. My story starts back in the mid-90s. This was a time when you learned things from things called books that were made out of paper. (Strange concept these days.) The Internet was getting started, but was not yet the go-to place where people got information. That meant that: 1. Information was harder to come by. 2. It was difficult to get a broad range of views on topics. I was reasonably healthy but high blood pressure was looming due to family history, I was starting to gain a bit of weight and didn't really have a ton of energy. What I learned was that: 1. The key way to health and weight control was exercise -- aerobic, to build muscle which burns more calories even at rest than fat. 2. You have to avoid fat, eat lots of complex carbohydrates, vegetables and fruit. 3. You need to watch your calories and eat less than you burn through exercise, etc. if you want to lose weight. Much of what I learned and believed can be summarized in a couple books that made perfect sense to me, particularly in the vacuum of other information sources. They were "Fit or Fat" and "The Fit or Fat Target Diet." by Covert Bailey. This low fat, high exercise approach worked fairly well for me, on and off at least. The "on" was when I was really regularly exercising. The "off" was at all other times. When I started that, I was getting into road cycling -- typically some pretty long rides like centuries or half-centuries. Cycling is an excellent calorie burning activity. For one thing, for me, it is an activity that I can do for extended periods of time because you are moving fast and able to avoid boredom. Cycling burns a lot of energy. An hour ride burns around 500 calories. A half-century burns around 2000-3000 calories (almost double an average day) and a century burns around 4000-5000 calories. For various reasons, I got out of cycling and then only the intermittent exercise I would do (stationary bike, treadmill, some weightlifting) would keep me at any level of fitness, and allow me to keep weight off. Simultaneously, and not coincidentally, other health markers declined. Most importantly, my blood pressure gradually increased being "borderline high" for a number of years, despite avoiding sodium and largely following the low fat guidance, finally spiking at a somewhat "scary high" level, meaning that I now had to get on medication. I was daily taking a combined beta blocker and diuretic. It did indeed control my blood pressure. Of course, as with most modern medications, it also brought side effects. Initially I experienced some tiredness, but this wasn't bad, it was more a feeling of relaxation that eventually went away. Worse though, after several years on the medication, I discovered that my potassium levels were seriously low. So, I started taking a prescription potassium supplement, eventually taking a very large does just to keep my serum potassium levels reasonable. I was getting regular heartburn which I thought was probably due to the potassium, but as you'll soon see had nothing to do with that. Over the years, while my blood pressure stayed fairly stable, other, not-so-positive things were happening. I was beginning to get arthritis symptoms, particularly in my hands. The heartburn continued and gradually got more frequent. (I was taking Prevacid almost daily and sometimes had to take courses of Prilosec.) My doctor wasn't happy with my cholesterol numbers (he was of course focused on total and LDL cholesterol but my triglycerides were also above normal.) I had started to take fish oil for a few years and that had helped my arthritis symptoms somewhat and actually brought my HDL numbers just into the normal range. My blood glucose numbers were getting worse, to the point I was considered pre-diabetic. Less quantitative, but easily important things were happening as well. I was getting less and less able to even think about doing what I thought would make me healthier. While I still tried to eat what I thought was healthy, I would give into temptation more and more when those cookies were sitting out at a business meeting, or having an evening snack that I knew I didn’t need. I would also think about exercising but seldom would I have the energy to start, or if I started would I have the energy to keep it up. I got to the point that I was starting to resign myself that I was too old to really change my health or fitness level significantly, and figured I would continue to gain weight, would continue to take prescription medications the rest of my life (and add to those that I was already taking.) I thought this was just an expected part of the aging process and without some super-human effort, which I didn’t feel I had in me, was impossible to change. There was quite a bit of buzz about low carb several years back, even to the point that restaurants were offering lettuce-wraps etc, I never paid much attention or thought that these people were missing the point that the problem wasn’t the bun or the bread but the fat in the sandwich that was being lettuce-wrapped. OK, epiphany might be a little melodramatic, but I can actually remember the specific time when I thought; “If this is true, this could be the way I could get healthier and get off of my regular prescription medication.” But before I describe this, a little more background. Going back to my previous learning on nutrition and health from Covert Bailey, I remember he cautioned strongly against very low carb (aka, Adkins-style) diets. His warning, among other things, was that they were essentially starvation diets that had extreme rebound (weight gain) effects should you ever stray off of them. With that in mind, my re-education began when a friend of mine was surprisingly diagnosed with type 2 diabetes. He told me that he was going to be going on a low carb diet of some sort to help control his blood sugar. This brought back the warnings that I remembered from the “Fit or Fat” books and remember actually cautioning him that I had heard that these low carb diets could get you into trouble, particularly if you ever went off of them. I also heard a couple other comments from various places about low carb diets, etc, but never paid them much attention. I thought I knew the right path to health and weight control and that was the conventional wisdom of low fat, eating lots of healthy whole grains, and plenty of exercise. Being the geek that I am, while all of what I heard made perfect sense, I had to do some research for myself. For the next several weeks, I read books, blogs and did other internet research and learned what I could about this concept. I finally decided to start, actually a joint decision with my wife who also wanted to try it. We started rather suddenly one weekend after going to a couple health food stores reading labels and browsing to see what we could eat. That was followed a week or so later with a major purging of carbs from the house. About a week into eating this way, I experienced about a day of feeling pretty weak and with a pretty bad headache. (This is a normal process as your body adjusts to burning fat once again after a lifetime of being dependent on the glucose that comes for carbs.) After that my energy returned to normal, and started exceeding the energy I had felt in a very long time. One of the things that changed significantly for me was heartburn. I had frequent heartburn (several times a week) before I started eating this way. I was taking Pepcid often and occasionally had to take Prilosec just to keep it under control. Since I started low carb, I have had no, that's zero, heartburn. That's for the two years since I started. The other thing that completely disappeared was the arthritis that was beginning in my hands. In a future post, I'll talk about measures of health and how these have changed for me.